Lucas Glover addressed his wife's legal troubles after Saturday's third round at the Desert Classic for the first time publicly, disputing details from last May's incident and emphasizing that he is excited for "closure." Krista Glover, Lucas's wife, avoided a trial and potential jail time on Friday, when she entered a deferred prosecution agreement in St. John County Court in Florida. But Lucas disputed initial Daily Mail reports that his wife had received 12 months probation in remarks to Golf Channel. 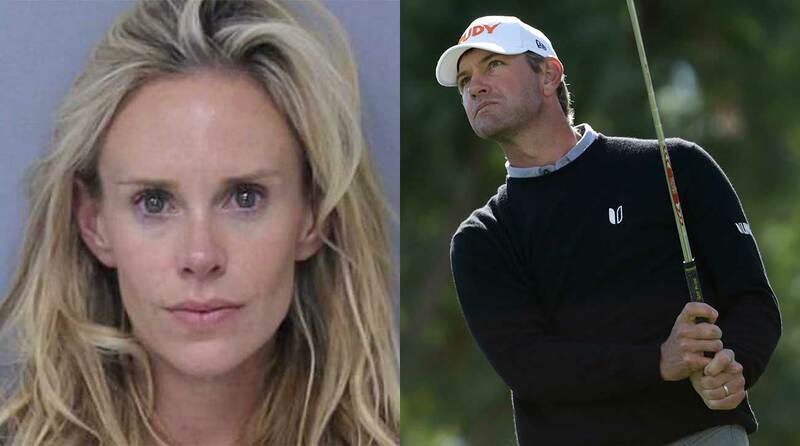 Krista, 37, was arrested at the couple’s Ponte Vedra, Fla., rental house after the third round of the Players Championship on May 12. After Lucas shot 78 and returned home to his family's rental house, Krista called 911 to report she was being attacked by her mother-in-law. Lucas called back and said that wasn’t the case. “My wife has gone crazy,” he was recorded saying. Krista Glover was arrested in May at the family's rental home at the Players Championship. The incident led to charges of battery and resisting arrest. According to the police report, Lucas and Krista were “in a verbal altercation” when officers arrived and Lucas told police that “every time he plays poorly in a tournament, Krista begins yelling at him, stating he is a loser.” Lucas and his mother, Hershey Glover, both had lacerations on their arms. Krista had no visible injuries. On Saturday, Glover disputed details from that report and subsequent reporting that referenced violence between husband and wife. “I can now say she never hit me,” Glover told Golf Channel's Rex Hoggard. “I don’t know why it was reported that way. We had to stay quiet until the case was over and we felt strongly this would be the result. We had to take the high road and say nothing, which was difficult. There were a lot of things we wanted to straighten out in the report but we couldn’t.” Golf Channel's report indicated the two have renewed their wedding vows. After a trying time, Lucas and Krista are looking forward to what's ahead. “This will be our closure that it’s behind us,” he said. Glover shot 68-68-68-67 to post 17-under for the week at the Desert Classic, good for a share of 12th place.